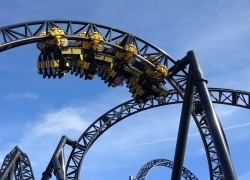 Four people have been seriously injured following a collision between two trains on the Smiler rollercoaster at Alton Towers. Four of the park’s guests sustained serious leg injuries, while another 12 riders received minor injuries in the incident. Air ambulances were among the emergency services called to the incident at the Staffordshire theme park, which occurred shortly after 2pm today. One of the ride’s trains was fully-laden with 16 park guests, while the other was empty. The rescue operation to recover those on board was not completed until several hours after the incident, owing to the ride’s densley-packed track layout. An eyewitness account given live on BBC television suggests that the ride continued forward after a period of being stopped on one of its two lift hills. The halting of the train laden with guests was reportedly caused due to the empty train, further ahead in the ride, failing to complete an inversion. The laden train then unexpectedly continued forward, descending from height into the path of the stalled train. Another eyewitness consistently said that one train was “stationary”, while the laden train was “sent” over the lift hill, with a “massive bang” ensuing. Alton Towers will be closed on Wednesday, as the Health and Safety Executive (HSE) conducts investigative work. Shares in the park’s operating company Merlin Entertainments fell on the London Stock Exchange, closing more than 3% down at the end of trading. 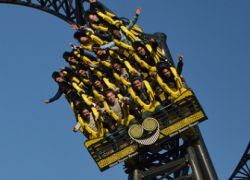 The Gerstlauer-manufactured Smiler rollercoaster was opened in May 2013, and was dogged by incidents in its opening season. Part of the track came partially detached, with a bolt narrowly missing park guests queuing for the ride. Guidance wheels became detached, striking riders and causing minor injuries in the same year. The ride holds the record for having the most track inversions of any rollercoaster in the world, at 14.